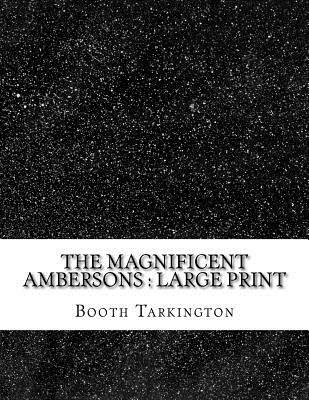 The Magnificent Ambersons: Large Print by Booth Tarkington ay food for the winter, or goods to trade for food, and they often feared they had not stored enough--they left traces of that fear in their sons and grandsons. In the minds of most of these, indeed, their thrift was next to their religion: to save, even for the sake of saving, was their earliest lesson and discipline. No matter how prosperous they were, they could not spend money either upon "art," or upon mere luxury and entertainment, without a sense of sin. Against so homespun a background the magnificence of the Ambersons was as conspicuous as a brass band at a funeral. Major Amberson bought two hundred acres of land at the end of National Avenue; and through this tract he built broad streets and cross-streets; paved them with cedar block, and curbed them with stone. He set up fountains, here and there, where the streets intersected, and at symmetrical intervals placed cast-iron statues, painted white, with their titles clear upon the pedestals: Minerva, Mercury, Hercules, Venus, Gladiator, Empero We are delighted to publish this classic book as part of our extensive Classic Library collection. Many of the books in our collection have been out of print for decades, and therefore have not been accessible to the general public. The aim of our publishing program is to facilitate rapid access to this vast reservoir of literature, and our view is that this is a significant literary work, which deserves to be brought back into print after many decades. The contents of the vast majority of titles in the Classic Library have been scanned from the original works. To ensure a high quality product, each title has been meticulously hand curated by our staff. Our philosophy has been guided by a desire to provide the reader with a book that is as close as possible to ownership of the original work. We hope that you will enjoy this wonderful classic work, and that for you it becomes an enriching experience.